Why are horses such good cow followers? Have you seen a cow working overtime? 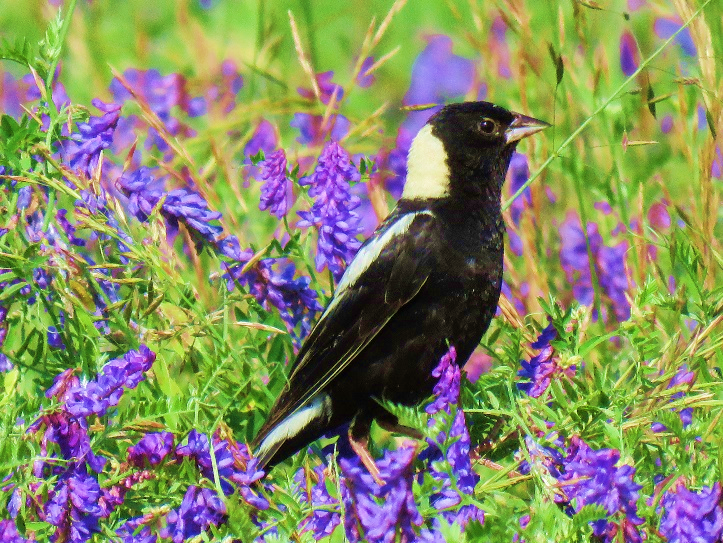 Grassland birds provide numerous environmental benefits to agriculture, from pollination to pest control. 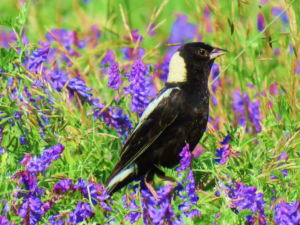 In spite of that, grassland birds are declining in the U.S. mainly due to hayfield mowing during the weeks that birds such as Bobolinks are actively nesting. 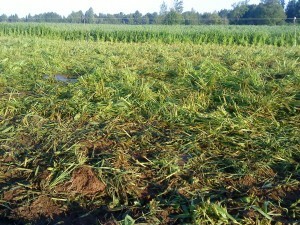 Farmers, face challenges that force them to mow earlier and or more frequently. To protect these grassland birds and working farms, The University of Connecticut and the University of Vermont are working on developing new strategies for reconciling conservation and production on private farms. The research project aims to create profitable markets for farmers delivering environmental benefits – and our team is seeking farmer input. We are inviting farmers that have a hayfield or pasture of 10 acres* -potentially good habitat for breeding bobolinks and other grassland birds- in Vermont, Connecticut, Massachusetts or New Hampshire, to participate in a 2-hour Decision Making Session Regarding Managing Hayfields for Bobolinks. Focus groups will be held in April 2018. In our work with livestock farmers, we are well aware that many farmers truly want to use practices that are in balance with nature, but that the financial costs of doing so can get in the way. I was excited to help get involved with a project that was providing the financial compensation that would allow farmers to be paid the real cost of delaying their mowing schedules. 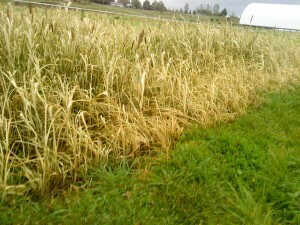 To non-farmers, the implications of a delayed mowing schedule might not be obvious. But since the hay that results from mowing is the cash crop that the farmer is counting on, the decision is one with cost. Participant farmers will be offered up to $150 to participate in this session, and then paid additional money for managing their land if chosen. Many of the farmers we work with believe, like we do, that healthy natural ecosystems are the foundation for human health and agriculture that’s productive in the long-run. They want to be able to keep their farms viable and be ecologically sustainable too. For us, supporting farmers so they’re able to support the natural environment makes sense for all of us. Often times, we pass by horse farms and marvel at their idyllic views of green pastures and beautiful animals. 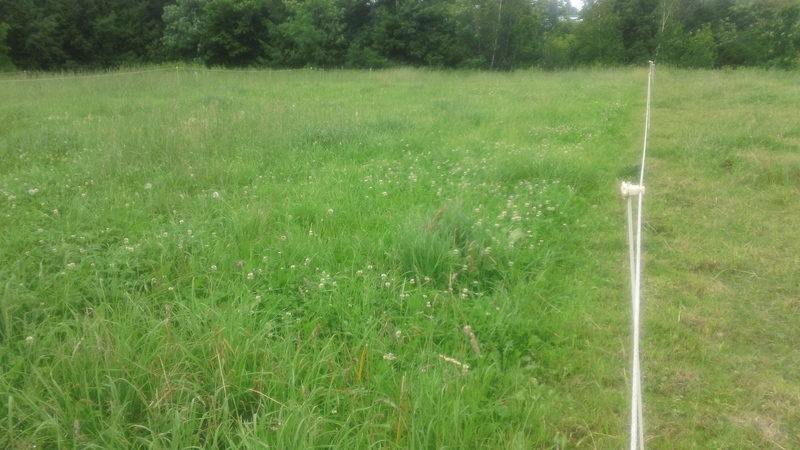 But – unfortunately – far too often these pastures are grazed too low and overgrazed. Horses evolved following ruminant livestock. The absence of fencing allowed them to graze and move on to the next fresh pasture and only returning when forages were ready again. As with any species of grazing animal, overgrazing results from letting animals re-graze the same plants for too long. 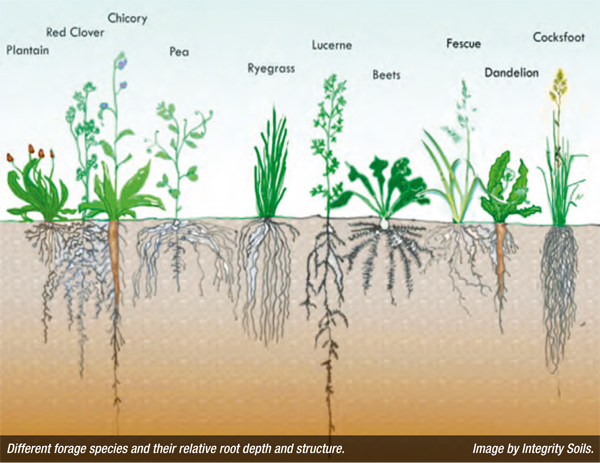 This can create an array of problems that cost the farmer money and take a toll on soil and water quality, ranging from poor forage production, increased costs with feed purchases, persistent weeds, lower fertility, soil exposure, compaction and erosion. Because horses have teeth in both their upper and lower jaws, they can graze right down nearly to the ground – much shorter than other grazing animals leave their forage, and much shorter than is healthy for the plants in the pasture. 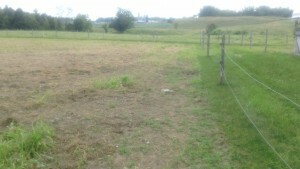 A ready solution is to subdivide the pasture divisions into smaller areas, and rotate animals through them. 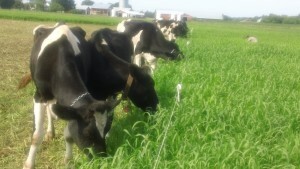 This enable forages in grazed paddocks to rest and grow to a proper grazing height, replenishing carbohydrates (sugar, energy) reserves while producing more forage that’s also of a higher quality. This also helps distribute the manure more evenly. 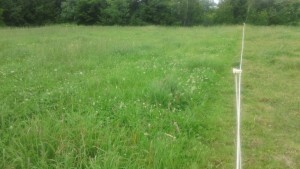 Ideally, cool season pastures should not be grazed below four inches high, because doing so will demand longer recovery periods. If you are considering grazing mixed species, and are concerned about forage quantity, different animal species have different grazing preferences and forage overlap is hardly a problem in diverse pastures. 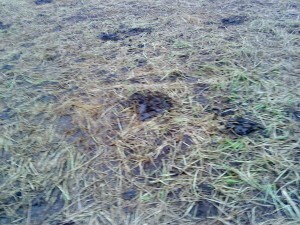 Another great advantage of mixed species grazing is that, different animal species are affected by different parasites. Juan Dutra moving his cows into a new paddock. Dutra usually uses horses as follow up group. 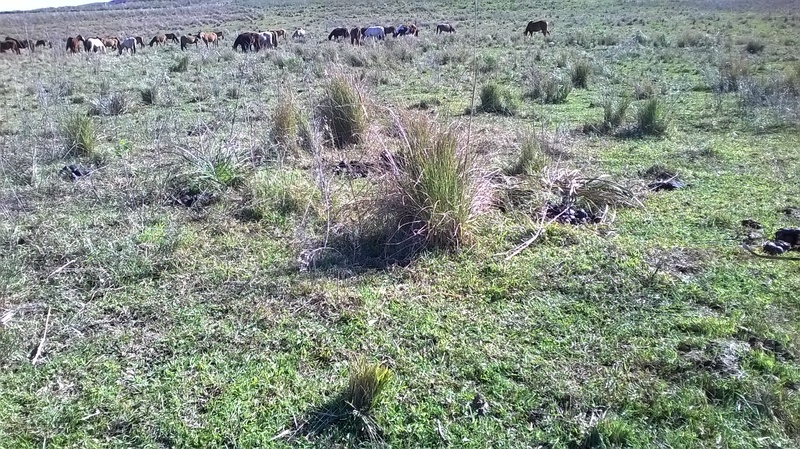 Horses also benefit from rougher pastures, and perennial forages –which cost nearly nothing to regrow and can provide the nutritious feed horses need to be healthy-, can be one of the greatest feeding resources to sustain them, avoiding non-structural carbohydrates’ present in the lower part of grasses. However, to tap into this great free resource, horse keepers must ensure that their pastures have enough quantity (dry matter) of diverse forages, in order to lower their feed and maintenance costs. 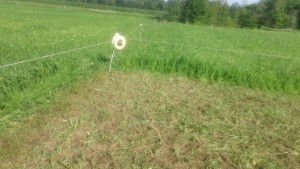 As in any grazing, it is important to identify the correct “stocking rate” (how many animals a given pasture will support) and plan the rotation. In order to know this, we have to know two additional things: 1) How much forage the specific animal (or group of animals) will need and, 2) How much forage is available throughout the grazing season. Check this step-by-step grazing math worksheet to help ensure that you always have enough forage of the best quality to supply to your animals. You can download these amazing grazing charts from our friend Troy Bishop, and posted by OnPasture. 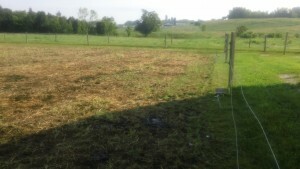 Electric tapes are a prefered option to polywire or high tensile to help horses visualize the fence. Consider rectangular paddock designs over other shapes (i.e. square), so that animals have a longer section to trot and exercise. 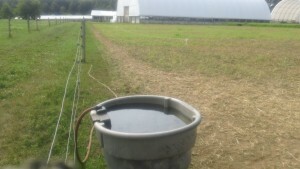 Provide high quality water and move the stock water tank to the paddock where the horse is grazing. If possible, plan for shade and shelter for best comfort during warm or cold days. Horses make a perfect follow up grazers when mixed up with cows. 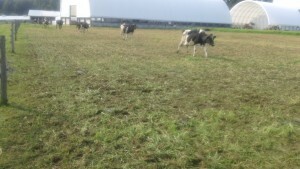 They can graze low to medium quality forages and they also graze well around repugnance areas. Walk your pastures frequently and enjoy observing your horses grazing behavior and the status of each paddock. Spring is here, and most livestock producers I know are itching to start grazing their cows after a long winter and pretty wet Spring. After all, taking advantage of the best pastures of the year (a.k.a. spring pastures!) seems the way to go. 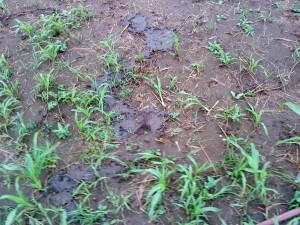 Spring pastures grow very fast, due to their specific phenology, recharged soils and plant root reserves. 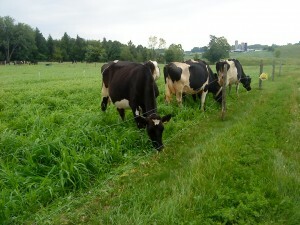 Producers know that they have to start grazing their animals to be able to guide pasture growth to make the best of it. 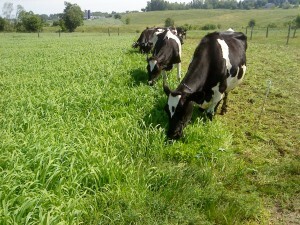 Animals also have the chance to get the best out of these spring pastures. But not so fast! Immature grazing pastures can present challenges that may interfere in the growth and health of your animals. When forages are grazed at a young stage, or concentrate over voluminous rate is high, causing cows to ingested too much concentrate and too little fiber, it can cause imbalances that can make your animals sick. For instance, you might see a cow eject slurry feces from its rear end. This can be an indication that a cow is ill; however, sometimes it is also an indication of unbalanced diet, like a spring pasture can present. First, it is important to check whether the whole herd presents these symptoms, which can indicate acidosis. Then, make sure all the affected animals are presented with hay and other fiber-rich options. Then if these symptoms do not go away, call the vet right away. To keep your herd healthy, make sure they’ve got a balance diet that includes enough fiber. In addition to the tender plants on the spring pasture, include plenty of hay or encourage them to graze in diverse grass-legume-forb forages. A recently-completed research project yielded interesting results regarding dairy cows’ productivity and how much time they spent laying in the field. Cow’s day time behavioral activities can be roughly divided by: feeding (3-5 h per day); resting (12-14 h); social interaction (2 to 3 h); rumination (7-10 h); water ingestion (30 min) other management activities (2 h) with some of these overlapping. Ideally, most cows lay down for over a third of the day. If you see a cow standing while the majority are resting, feeding, ruminating, socializing o drinking water, you must observe its behavior and check whether there is adequate supply of feed, quality water, space or flight zone space. 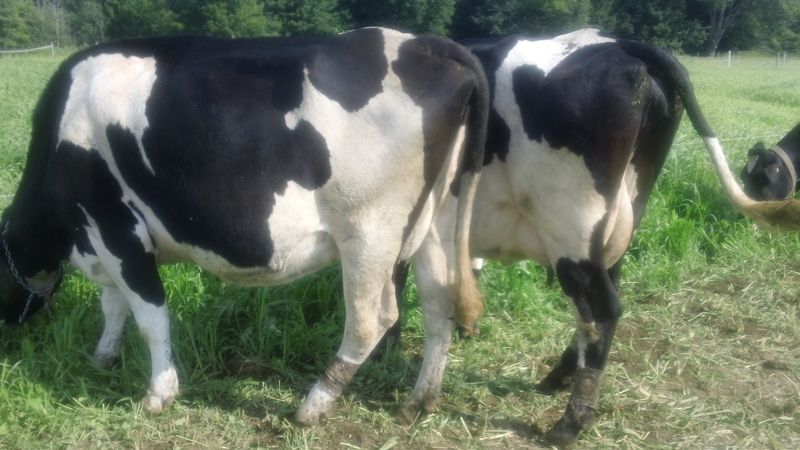 In a study performed by a team of University of Vermont researchers* at an organic dairy in Franklin County, Vermont, we verified that cows with longer laying bouts were the most productive. 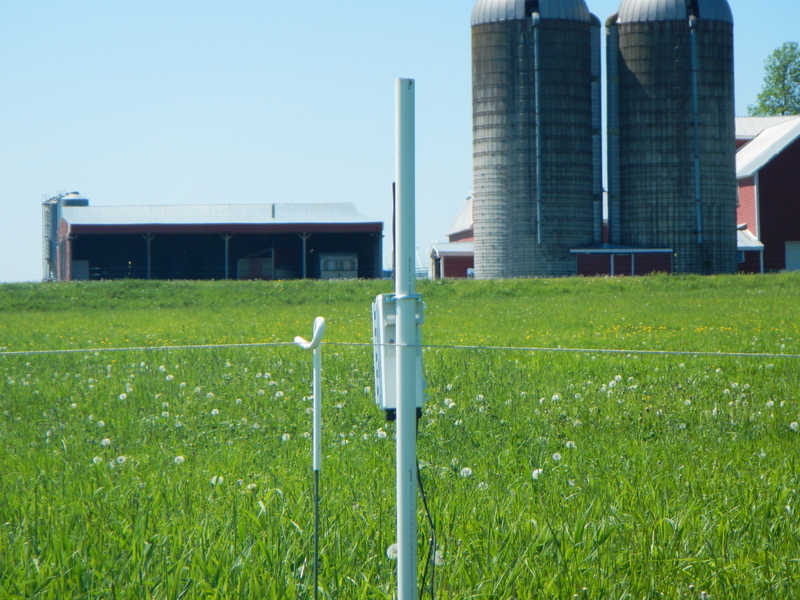 We fitted tri-axial accelerometers to eight Holstein dairy cows and studied their grazing behavior during 10 weeks, from June to September over three different diets: in-barn feed, cool season pastures, a warm-season grass (Wonderleaf Pearl Millet). We found out that cows differ in lying time. The average lying time was a little over 9 hours (ranging from 6 to 12h). We found no effects of pasture regime on lying time but the higher producing cows had longer lying times. In sum, cows don’t work overtime, and they may get more productive when resting for longer time. 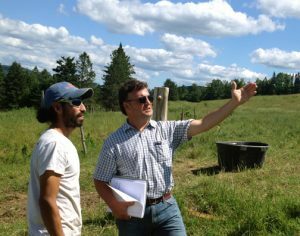 Juan assisting a farmer in Northeast Vermont. We are very pleased to announce that Technical Coordinator Dr. Juan Alvez has just embarked on a multi-year grazing research partnership hosted by Philo Ridge Farm. This research will evaluate forage production under different management strategies, soil health, animal productivity, and more. Read more at Philo Ridge’s web site! We’re super excited. Congrats, Juan! In 2013, our research team* embarked on a collaborative, long-term study focused on understanding how ecologic habitat disruption is associated with livestock wellbeing and health, and how that can affect society. This is far from a local or unique issue. With human population growing above 7 billion people, a demand for higher living standards, including dairy products as more people seek access to all forms of animal protein as part of a more affluent lifestyle, is ever increasing. Meeting this demand requires both advancing the agricultural frontier and an intensification of the production process, burdening already-degraded ecosystems, and impacting habitats, forests, biodiversity, soils, water and rural livelihoods. There is strong evidence that agriculture receives (and may provide), a diverse array of benefits from healthy ecosystems, and it also worsens problems when it disrupts them. symbionts (rumen microbiota). These cellulolytic bacteria break down plant materials, providing cows with a source of energy and nutrients. An understanding of the response of ruminant and environmental microbial communities to specific management practices will provide an opportunity to both optimize farm productivity and enhance ecosystem-based management. We had an integral approach to soils, forage and diet, rumen microbiology, grazing activity and milk quality, to evaluate how cows were affected. We hypothesize that biodiversity affects livestock well-being, health, and productivity, and that it may also affect cows’ grazing behaviors. To explore this, we studied how the relationship between grazing time and diet alters rumination activity, rumen pH and health, milk composition and productivity. Cows that grazed on diverse pastures presented higher concentrations of poly unsaturated fatty acids than when grazing a monoculture; they were able to transfer conjugated linoleic acid and omega-3 fatty acids from these pastures into the milk. We did not find any effects between pasture diet type and lying time but, there were differences among cows in laying time where higher producing cows had longer lying times. 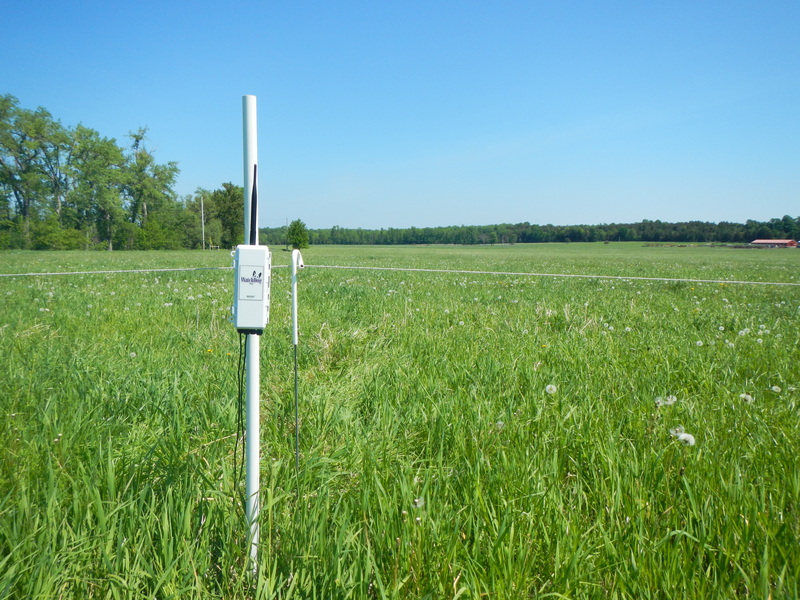 Overall we determined that pasture-based livestock who graze on pastures managed for increased biodiversity can help to improve soil health, optimize forage utilization, rumen activity, milk composition and quality reduce costs, and increase net farm income. By optimizing these production parameters, pasture-based dairy farmers can simultaneously advance cattle health and well-being, reduce operational costs and environmental impacts and produce the healthy dairy products society is demanding. 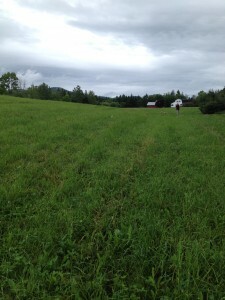 We hope that our work can explain the importance of maintaining a healthy ecosystem for Vermont farms. Full results will be published on a scientific article. 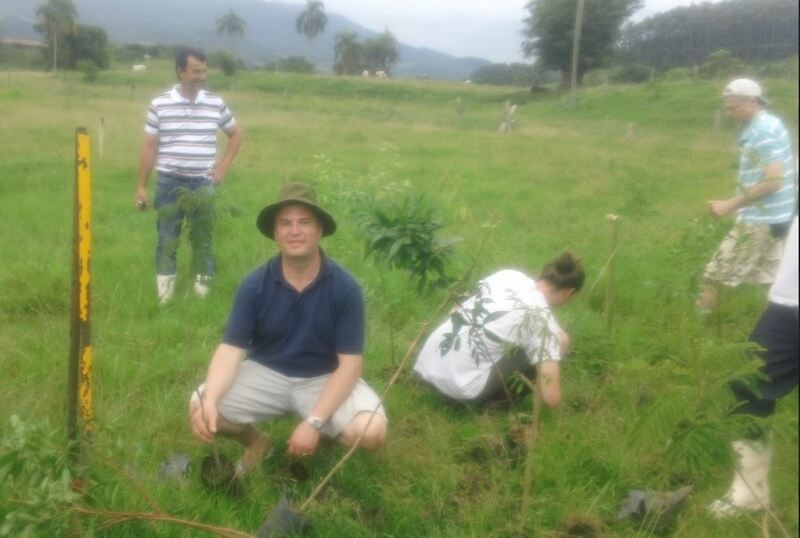 Early this year, my work in sustainable agriculture brought me to the State of Santa Catarina (Southern Brazil), as a co-instructor of “Agroecology, Ecosystem Services and Farmer’s Livelihoods”. There, I joined about twenty people, visiting farms located at the Atlantic Forest, on a 9-day applied field course and workshop. The event was hosted by Universities of Vermont and Universidade Federal de Santa Catarina. Santa Catarina and Vermont share many similarities, including topography, size and identity with rural living and family farms. On the other hand, Santa Catarina State has subtropical humid climate and the level of deforestation reaches over 88%. Also, the Atlantic forest is considered a biodiversity hotspot, harboring more species per hectare than NE U.S. While formerly, most farmers planted tobacco, eucalyptus and other high input crops, currently they still face the challenges of farming in very steep terrains and providing for their families. Soil erosion, nutrient runoff and water quality were a rampant problem. 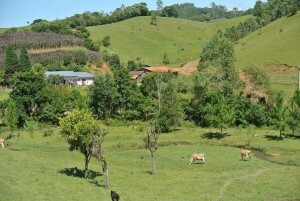 However, the main challenge is to meet the requirements set by the Brazilian Forest Act. Currently most of these farmers and specially the smallest ones, are occupying areas of permanent preservation such as hilltops, riparian areas and water sources thus, clearly infringing environmental laws. 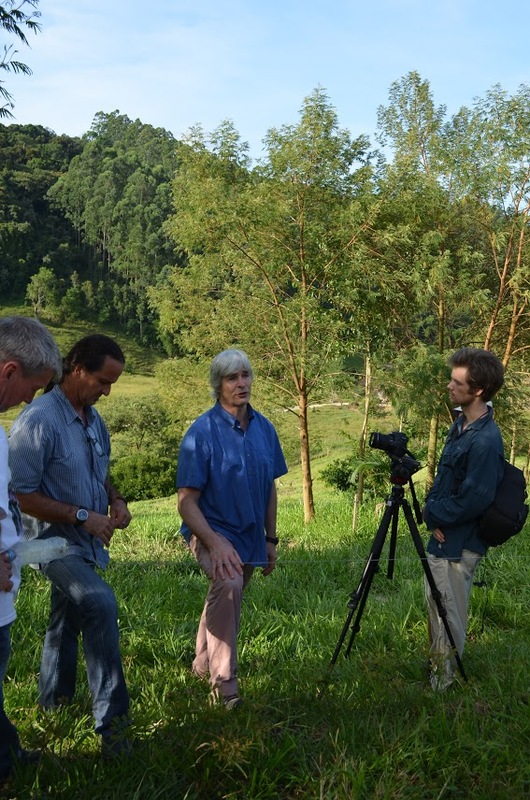 This workshop aimed to contribute to a long-term search for creative solutions that can help promote conservation, restore the Atlantic Forest, preserving its rich biodiversity and sustaining rural livelihoods through agroecological practices. We visited the town of Santa Rosa De Lima, –also known as the “agro-ecology capital of Brazil”-, to study silvopastoral systems with high-levels of native biodiversity. The focus was on how different agroecological practices can support conservation efforts in Santa Catarina. Specifically, we wanted to investigate how combining new forest patches with management-intensive grazing (MIG) can be one of the approaches to address deforestation, improving dairy production and keeping families in their farms. Previously, it has been found that farmers who switched to MIG observed improvements in environmental and production variables with increases in pasture productivity, with 55% reporting a slight increase in pasture area without deforesting new areas. A larger herd size was achieved in 63% of the farms surveyed. Daily total milk production and productivity per animal increased by 80% and 73%, respectively. Improvements in soil cover, soil quality, and soil moisture were reported in 87%, 95%, and 80% of surveyed farms. Producers also perceived a stabilization and reduction of erosion gullies; electric fencing restricted animal access to rivers, which decreased in 59% of farms, while riparian buffers increased in 22% of the properties. Thus, perceived water quality improved for 29% of interviewees. 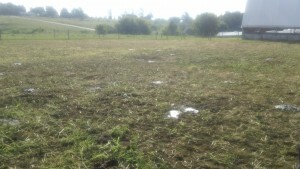 Ticks diminished in 73% of the farms, mastitis in 80%, intestinal worms in 67%. Pesticide use dropped in 60% of farms and TMR fed to animals decreased in 49% of the farms. Manure accumulation in the milk parlor dropped in 53%, and workload fell from 8 to 4 hours per day in 66% of the farms respectively. Consequently, 67% of the farms reported better quality of life. Lastly, economic return was optimal or within expectations for 67% of farmers and production costs fell according to 34% of interviewees. This long-term collaboration has ties to Vermont, with inspirations that can be tracked two decades ago, influenced by Bill Murphy (Professor Emeritus of UVM, PSS). 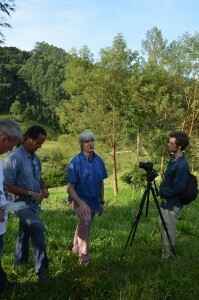 The on-going collaboration includes three University of Vermont institutions, the Gund Institute for Ecological Economics, the Center for Sustainable Agriculture, the Department of Community Development and Applied Economics, and students and researchers from two Brazilian Universities (Universidade Federal de Santa Catarina and Universidade de Sao Paulo). As predictions for the Northeastern U.S. suggest wetter, warmer climate in the near future, the use of technology such as precision agriculture, can be of great use to enable a more sustainable modern day farming. 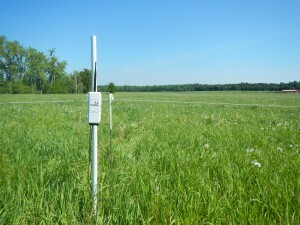 One of the tools the Center for Sustainable Agriculture (UVM Extension) is using to evaluate, for example, the most appropriate moment to graze, are soil moisture sensors (SMS). They can track real-time water movement and record information that can be instantly viewed on a computer or on a smartphone. 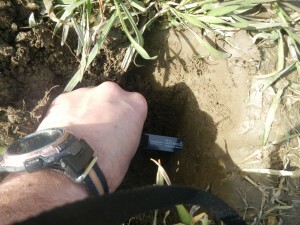 Soil moisture varies depending on soil types, precipitation and temperature. Soil moisture devices can be used under several ground cover conditions, and can help create moisture maps of the areas by the use of global positioning systems (GPS) at any given time in the season. By using devices such as SMS, farmers are able to make real-time decisions about where they will place their animals, establish crops and without causing soil compaction or destroying their ground cover. In 2015, we installed three-SMS at Health Hero Island Farm in South Hero, VT as part of a 3-year USDA NRCS funded research. Eric Nöel -who grazes about 80 cows at Health Hero Island Farm-, welcomes cutting-edge research that can help him and other farmers take instant action on farm management decisions. Nöel understands that placing animals or, running machinery on wet soils can quickly aggravate soil physical conditions like structure, compaction and infiltration. Pearl millet or Millet [Pennisetum americanum (L.) R. Br. is a warm season annual grass that is well-adapted to fertile soils. With proper management millet can easily yield around 10 ton of forage to the acre, right when cool-season forages nearly stop growing due to hydric stress. Millet has an excellent quality, with low tannins and high protein, calcium, phosphorus and digestibility levels. 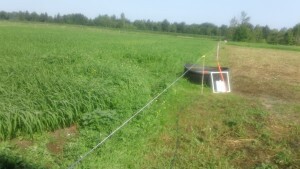 Additionally, preliminary [non-conclusive] results of a study conducted in Vermont evidence that its fatty acid profile is similar to that of the diverse cool-season forages in the Northeastern U.S. These benefits show up in the milk or meat of animals that graze it, delivering excellent health benefits. Millet loves heat and it is drought tolerant but can endure wet soils. 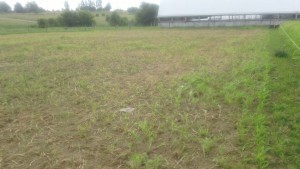 It must be established in early summer (by the end of May, beginning of June), at the average rate of 20 pounds per acre. 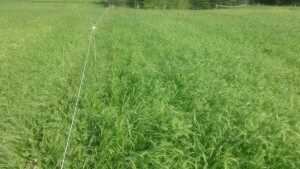 It can be potentially ready to be grazed around mid-July on. 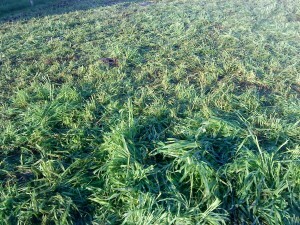 If carefully managed, it can yield two or even three grazing rotations until the first frost. 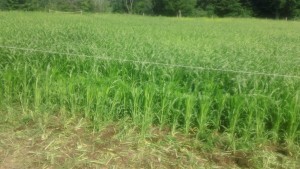 Millet heavily grazed; almost no pulse! First frost (Sept 19, 2014), end of the line! 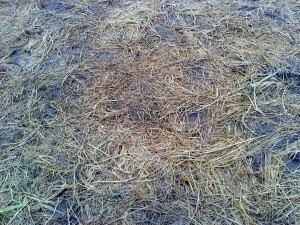 Millet can be used for grazing, hay, silage or green-chop. 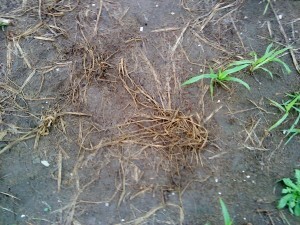 Pasture management research and observation recommends to start grazing millet before boot stage, when it reaches between 18 and 24 inches high, leaving about 10 to 12 inches of residue. 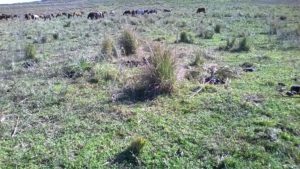 Millet can take a lot of grazing pressure and animals must be allowed to graze a paddock for a few hours per day or, rotated as many times as needed per day. The use of strip-grazing with a back fence is strongly recommended to promote faster re-growth while avoiding damaging it.Prussic acid is not a concern in Pearl Millet but nitrate poisoning can be a problem if, a) high nitrogen fertilization rates are applied, b) prolonged droughts are followed by rain; and c) encountering any condition that kills the plant but not the roots such as, frost, hail, grazing and trampling, etc. In a study we conducted during 2014 at a farm in Highgate, Vermont, we drilled 7 acres of millet on a beaten “sacrifice” paddock. 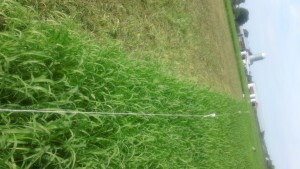 Millet was exposed to different levels of grazing pressure: light, medium and heavly grazed. In each condition, its re-growth was impressively vigorous, even when plants looked heavily grazed and with little chances of recovering. So, when planning your next cover crop give Pearl Millet a try! Any reference to commercial products, trade names, websites or brand names is for information only, and no endorsement or approval is intended. Right-sizing. It’s what all farms must do if they are to stay profitable, and in balance, preserving the integrity of the soil, water and air, both on the farm and in the surrounding environment. As the water quality issue moves Vermont and its agricultural community into deeper levels of debate on how to address the issue, it’s clear that each farm must also work to find that “right size”. 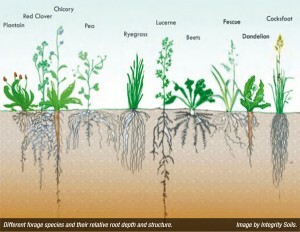 Each farm has a unique set of variables due to its bedrock, soils, topography, water – both underground and on the surface, type of livestock, vegetation and owner. It’s not unlike baking a cake. You lay out the ingredients, and then commence with the mixing them in the proper proportion for taste, lightness and the fit to the pan it will be baked in – in other words – rightsizing. If the proportions are off, it won’t taste good, it may not rise, and it won’t fit in the pan, and overflow onto the oven floor for a tedious clean-up. That can happen with farms too. Unfortunately, overflow from a farm is more than just tedious, it is costly – nutrients are lost and overloaded vegetation, soil and water sputter with the suffocation in a toxic brew or starve with overtaxing removal of nutrients needed for reproduction. The productivity potential is lost. Not only does the farm lose, but we all do as that toxicity taxes the local and collectively owned environment, lessening its productivity as well. For example, if the wet areas or streams on your farm look like chocolate milk every time there is precipitation, even the lightest sprinkle, nutrients are not being absorbed on the farm, and instead are making a quick exit. If you find you are feeding out stored feed by the beginning of July, you might want to think about reevaluating your land/livestock ratio, or at least your current management of them. These are signals of a need for better balance, and a change in management is often the simplest, and least expensive approach for getting started. Buffalo, cows and horses are heavy animals with 1,000 pounds and more distributed on four feet. Confine them to a small area for weeks or months and it doesn’t take long before problems arise. 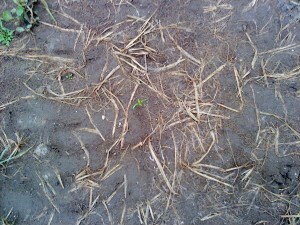 Equally disruptive is frequent tillage and constant bare soil exposure. Moving air and water can hastily capture the freely floating nutrients, and carry them away, dropping them where they might not be needed or wanted – such as Lake Champlain. Two years ago while attending a conference on grazing, I listened to a farmer describing the journey he had made after rejecting the conventional practices expected for a farming operation. He rejected that path because he was losing so much money, yet working harder than ever, and had no time with his family. His farm was not healthy and neither was he. Yet farming was his choice of profession. He decided to trust his own observations and judgement and after several years of trials seeking the match for the soils, the water, the vegetation, the livestock and the quality of life he wanted, he found the right size for his farm. The familiarity was instant – this is a concept that I know many of my colleagues and myself carry around in our minds, minus a commonly agreed upon term. I like this word – it’s succinct, and descriptive. And it really is the core of what we do – working with farmers to find that sweet spot of what the farm has for ingredients, and potential for productivity and how best to manage those ingredients for the best possible outcome for the immediate, and with an eye for continued productivity – sustainability – for the future. As a technical service provider, we have a fine line to walk – listening to what the producer wants and providing them with the information from research, yet also informing them of any and all parameters – both those laid down in the natural world and those made by humans. This coming field season, we look forward to working with livestock farmers to find the right size for their operations – keeping the soil and water on their farms and in the river, clean, healthy and productive.